Stir Coffee occupies a lovely south-facing spot on the corner of Brixton Hill/Arodene Road. A narrow, slightly tapering wedge, the long side faces south on Arodene Road, while the narrow side, consisting of three almost floor-to-ceiling windows, looks west onto the busy Brixton Hill. The door is right on the corner, with two long, communal tables with benches in the windows to the left, while there’s a four-seat window-bar to the right. This overlooks three tables on the pavement on the comparatively quiet Arodene Road. The counter’s set back on the left, starting just as Stir begins to narrow. The espresso machine faces the tables/windows to the front, while the counter’s long side, with till, cakes and food, faces Arodene Road. There are retail shelves on the wall before the counter, holding beans and coffee-making kit, while beyond the counter is a chiller cabinet, with shelves above for the various soft drinks and bottled/canned beer (Stir recently got its licence). There’s a large space at the back which Stir has sensibly resisted filling. There’s a bench on the right-hand wall opposite the counter, but that’s about it. Beyond this, Stir further narrows, a glass partition delineating a small, cosy, windowless seating area, all exposed brick, with three four-person tables on the left and a mirror propped up at the back. Although the only windows are at the front, the south/west aspect makes it really bright when the sun is out. The high, white ceilings and uncluttered layout add to the sense of space and light, while the back provides a more subdued, cosy environment if you want it. I got chatting with Sam, one of the owners, who was supposed to be helping me narrow down my choice of coffee. It’s refreshing to find a barista who is knowledgeable and enthusiastic about his coffee, but at the same time honest about its shortcomings. The guest espresso, was, for example, a little too bright for Sam’s tastes, but provided a real contrast to the house-blend. Meanwhile, of the filter options, while all were good, one wasn’t the best he’d had from that roaster and the other was roasted a little too dark to get the best out of the coffee. In the end, this left me wanting to try all of them, but instead, with the visit to the Volcano/Assembly launch hanging over me, I decided to have the decaf (a single-origin Brazilian from Mission Coffee Works which Sam rated highly) as a cortado to go with my lunch, followed by a V60 of a honey-processed coffee from El Salvador roasted by Assembly (the other two choices were both Kenyans). My lunch was a lovely vegetarian empanadas, toasted with a side salad. The pastry was excellent, rich and flaky, while the filling was extremely tasty. My cortado was also excellent, the coffee’s natural sweetness going well with the milk, while some fruity notes came strongly through. It was also commendably small, arriving in an espresso cup. My V60 was made with the continuous-pouring technique and was served in a carafe with a glass on the side. Looking like red wine in the carafe, it had an almost wine-like quality on the first sip. Very rich, fruity and well-balanced, it is one of those where you never quite recapture that first mouthful, leaving you chasing the taste to the bottom of the cup. Or, in this case, glass. I paired it with a cinnamon bun which also arrived warm. More Scandinavian in inspiration than American, it had a rich, chewy dough that was sprinkled with cinnamon sugar and wasn’t at all sticky. 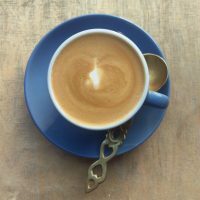 This entry was posted in Breakfast, Cafes, Cake, Coffee & Beer, Evening Opening, Laptop Friendly, Lunch, South West London and tagged Assembly, include, Mission by Brian Williams. Bookmark the permalink.